Hey y’all thanks for checking out another video. This is where was starting from. 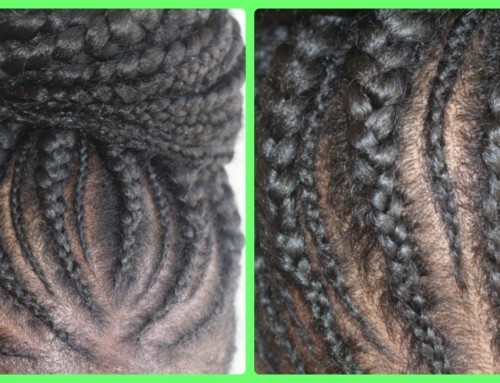 I detangled, washed, and conditioned her hair blow dried it parted off from ear to ear and separated it into two plats. I’m following up two days later. I’m going to twist her hair into two simple ponytails. Right now I’m just going to detail her hair. I’m going to part the back into four sections. Making sure where ever the X crosses is where I want the ponytail to come together. This is what I want her ponytail to come together. You will see in just a moment. Now, it is important that you keep all four sections separated by a clip or a rubber band because when you follow this technique it makes it easier to have the twist in uniform sizes. In each sections, I’m going to separate the twists into as even sizes as I can. It also makes the process go faster because you don’t have to stop and part each section. I’m going to apply TM hair products perfect assist styling aid to her hair. It’s a moisturizing styling a with a light to medium hold. 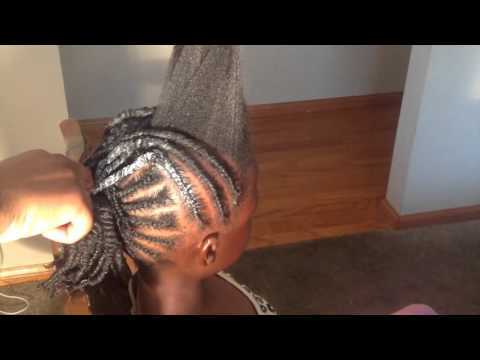 It protects her hair while it up in twists. It also moisturizes. Some people ask me what do you do with the moisturizing Perfect Assist styling aid. This is one of the ways to use the moisturizing styling aid. I also use it when I have my hair in weaves and wigs. I use it to braid my braid pattern down. 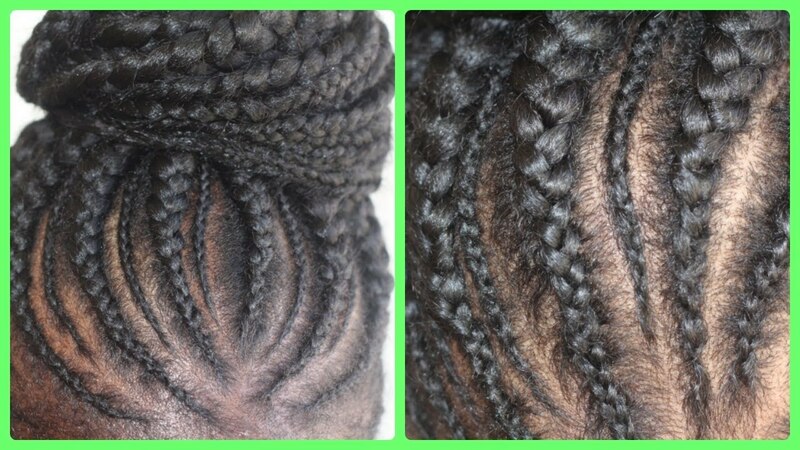 It is not greasy so it does not have my weeks leaves greasy and weighed down all it does is moisturize and protect my hair while it’s in a protective style, so I take it down it doesn’t feel like big leaves because it hasn’t had any protection or moisture. This is called again perfect assist styling aid by TM hair products is a moisturizing styling aid. 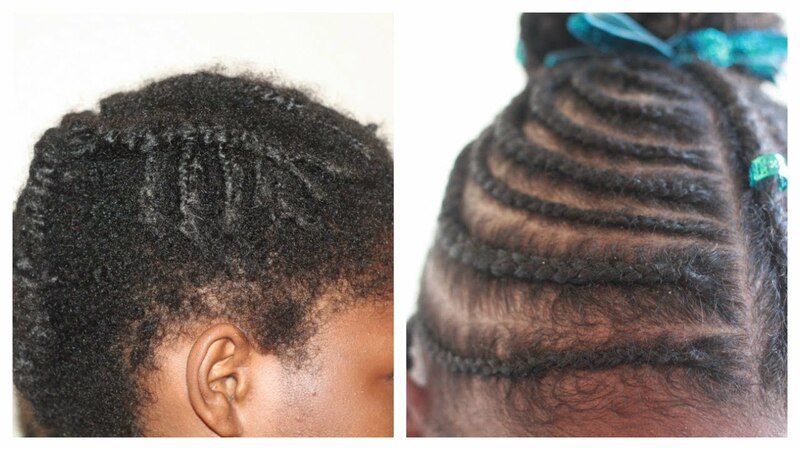 You can style your hair with it or you can use it to protect your hair when you’re wearing protective styles. If you like the greenhouse method this can be done with this product as well, but when you style your hair a give you a light hold and it also fights frizz. As you can see now we are more than halfway done. You can see when the light reflects her hair that her natural hair is shiny, and that is due to our smooth through detangler being used as a deep conditioner. It can be used in triple duty as a detangler, deep conditioner, and a cowash. I’m following the same steps separating her hair clipping it out of the way. With this moisturizer it does not leave your hair greasy it just leaves your hair moisturized. It adds a natural luster to your natural hair. A lot of times people with natural hair their hair tends to look dull and dry, or you have to pack it with so much oils and butters that you hear is greasy your four head is greasy your pillowcases greasy. That’s not the case with this moisturizer. Although, it is a moisturizer and it does contained organic oils and butters it does not leave your hair greasy you would not have a greasy pillowcase. This is a great moisturizer for a twist out for styles like that or a braid out because it leaves your hair super duper defined and moisturized. As you can see were almost done I’m just adding the final twist to her hair. 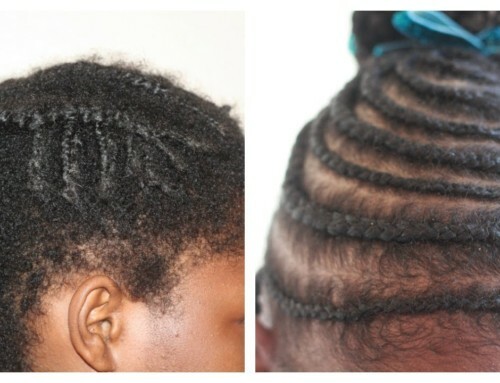 This style lasted her about three weeks and her hair was not greasy or oily when I took her hair down. Her hair was not dry. He was not legally dry. If you protect your hair for an extended amount of time you know exactly when talking about. This is about two days later. We decided to add ribbons. I have another video where I curled her hair, or I could’ve untwisted the twisted part of the ponytail but we kept it simple she wanted to be a little extra free for school because she had her dress on. That’s all we did we just kept it simple. I like the style because it’s nice and simple and clean. I like little girls to look like little girls so that’s what I was going for here this is also a protective style as well so I don’t have to manipulator here for another week of two I don’t have to comb it for at least a week or two. All she does is tied down with a satin scarf and put it on top of that and she’s good to go every day for school. Thanks a lot for watching guys and I will talk to you in the next video.